The Optimist Club in Vancouver, Washington is in fundraising mode and everyone is invited to participate, especially those of you who live in the Portland-Vancouver area. It's just a short trip to enjoy good food and fellowship and help make a little money for the cause. What's the cause? The Optimist Club of Vancouver Foundation is seeking donations for improvements for the following projects at the Youth Camp: restoration of the cook house to include foundation work, siding, and possibly a new roof as well as other camp maintenance work. What's the opportunity? Breakfast! 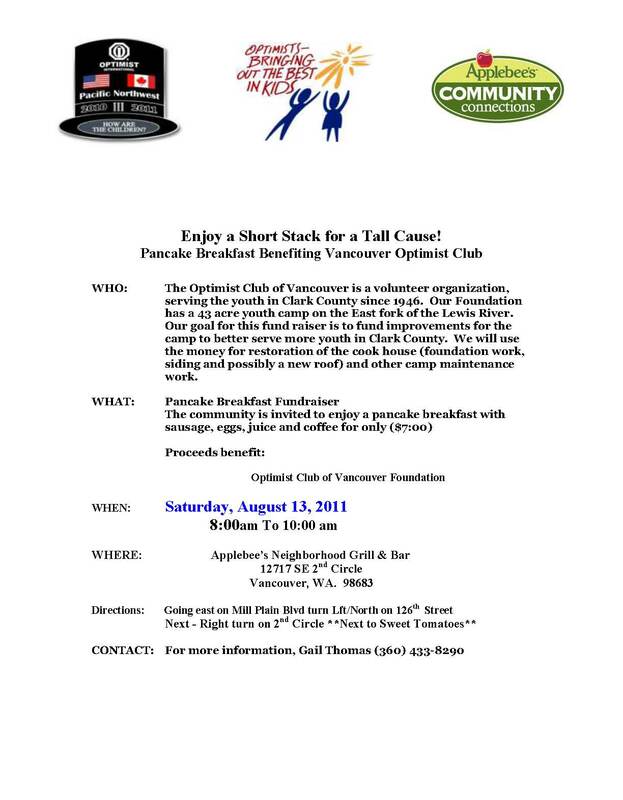 Stop by Applebee's, 12717 SE 2nd Circle, Vancouver between 8:00 and 10:00 a.m. on Saturday, August 13 and enjoy "short stack for a tall cause." 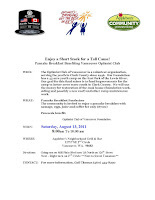 Your $7.00 donation will benefit the great work of the Optimist Club. Please click on the picture for details.